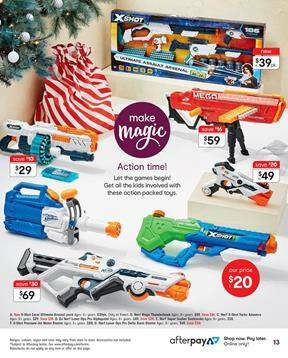 Christmas toys, exclusive products, Hot Wheels, Beyblade, board games and more are in this Kmart Catalogue. The most popular board games including Scrabble, Jumanji, Monopoly, Soggy Doggy, and many more are featured games on pg 12. Pay only $25 for these board games. Visit pg 13 for Nerf blasters, new products, X-shot and more are also available on that page. Check out RC vehicles like crawler king, hovercraft, Ferrari, sky view video drone and more. Check out more toys on pg 16-17 where Hot Wheels corkscrew crash track set and Beyblade toys are available. Kmart has masks, musical toys, pet carriers, make-up unicorn and other kind of toys on pg 18-19. For musical entertainment and education, check out pg 20-21. Karaoke machine with microphone stand can work with a tablet.